In his newest international bestseller, The European Dream: How Europe’s Vision of the Future is Quietly Eclipsing the American Dream, Mr Rifkin argues that while the great American Dream is fading, a powerful new European Dream is beginning to capture the attention and imagination of the World. The nascent European Dream, says Rifkin, is, in many respects, the mirror opposite of the American Dream, but far better suited to meet the challenges of a globalizing society in the 21st century. Rifkin draws on more than twenty years of personal experience working in Europe, where he has advised Heads of State and political parties, consulted with Europe’s leading companies, and helped spur grass-roots, environmental, and social justice campaigns. Mr Rifkin holds a degree in economics from the Wharton School of the University of Pennsylvania, and a degree in international affairs from the Fletcher School of Law and Diplomacy at Tufts University. Rifkin speaks frequently before government, business, labour and civic forums. He has lectured at more than 500 universities in some 25 countries in the past 30 years. Since 1994, Mr Rifkin has been a fellow at the Wharton School’s Executive Education Program, where he lectures to CEOs and senior corporate management from around the World on new trends in science and technology and their impacts on the global economy, society and the environment. Mr. Rifkin’s monthly column on global issues appears in many of the world’s leading newspapers and magazines, including The Guardian, Die Suddeutsche Zeitung in Germany, Le Soir and Knack in Belgium, L’Espresso in Italy, El Pais in Spain, Information in Denmark, Hospodarske noviny in the Czech Republic, Eesti Päevaleht in Estonia, Trud in Bulgaria, Clarin in Argentina, Al-Ittihad in the U.A.E, and Chosun Ilbo in Korea. 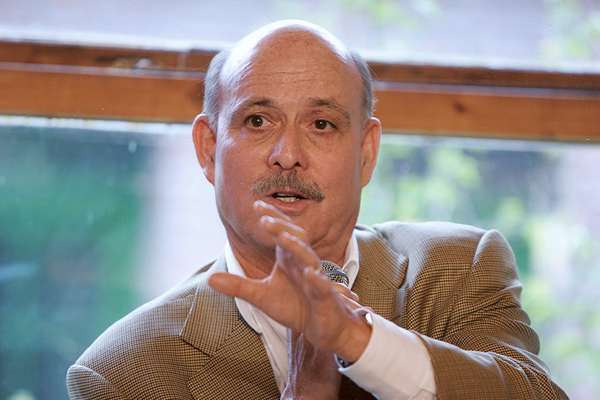 Rifkin has been influential in shaping public policy in the United States and around the world. He has testified before numerous congressional committees and has had consistent success in litigation to ensure responsible government policies on a variety of environmental, scientific and technology related issues. He has been a frequent guest on numerous television programs, including CNN’s Crossfire, Face the Nation, The Lehrer News Hour, 20/20, Larry King Live, Today, and Good Morning America. The National Journal named Rifkin as one of 150 most influential people in the US who have shaped federal government policy. Mr. Rifkin is the founder and president of The Foundation on Economic Trends in Washington, DC. The foundation examines the economic, environmental, social and cultural impacts of new technologies introduced into the global economy.